With Donald Trump&apos;s poll numbers falling after a series of inflammatory remarks and controversies, Democratic rival Hillary Clinton has opened up a comfortable lead. But even as her standing improves, the same polls show Americans still don&apos;t trust her. A Fox News poll released last week showed 36 percent of voters consider Clinton "honest and trustworthy," up from 30 percent in June in the same poll. Trump&apos;s "honest and trustworthy" numbers rose from 34 percent to 36 percent over the same period. In the horse race, Clinton was beating Trump 49 percent to 39 percent, according to the poll of 1,022 voters conducted July 31 to Aug. 2 with a 3-point margin of error. Last week&apos;s Washington Post/ABC News survey gave Clinton an 8 percentage point lead over Trump. Her untrustworthiness numbers are still high: 59 percent said Clinton is not honest and trustworthy and about two-thirds said she is too willing to bend the rules. Economist/YouGov polls since the beginning of the year show that while her favorability numbers are up less than a percentage point, she rates lower in trustworthiness now than she did in January. Women are more likely to give Clinton the benefit of the doubt — a Washington Post-ABC News poll from early August showed 43 percent of women find her trustworthy while only 34 percent of men do. Similarly, a CNN poll from the end of July found that while 34 percent of women say "honest and trustworthy" applies to Clinton, only 25 percent of men do. Clinton&apos;s rating on trustworthiness has not come close to 50 percent since the news first broke in March 2015 that she had used a private server to receive emails while serving as secretary of State, according to a CNN/ORC survey that went through some of her polling history. Since then, Republicans have used that issue and the FBI investigation into the case as another avenue to attack Clinton on her integrity. Clinton herself addressed the perception that she is untrustworthy in an interview with MSNBC talk show host Rachel Maddow before the New Hampshire primary. The Democratic nominee said that ever since she first came into the public spotlight in 1992, she has been "under relentless attack" and it "leaves a residue," even after the attacks are proven false. "I have to only conclude that there is a concerted effort to try to make partisan advantage by really throwing so much at me that even if little splatches of it stick, it will cloud people&apos;s judgements of me," she said. "So that&apos;s a burden I carry." Veteran political journalist Ron Fournier wrote back in February that Clinton&apos;s trustworthiness stems not from withholding facts, but from knowingly misleading the public on her scandals. Fournier, who has covered the Clintons since Bill Clinton was governor of Arkansas, said that Bill Clinton was given more of a free pass for his lies because "voters learned not to trust Bill Clinton to tell the truth about his private life. But they believed him when he said he got up every morning determined to work for them." 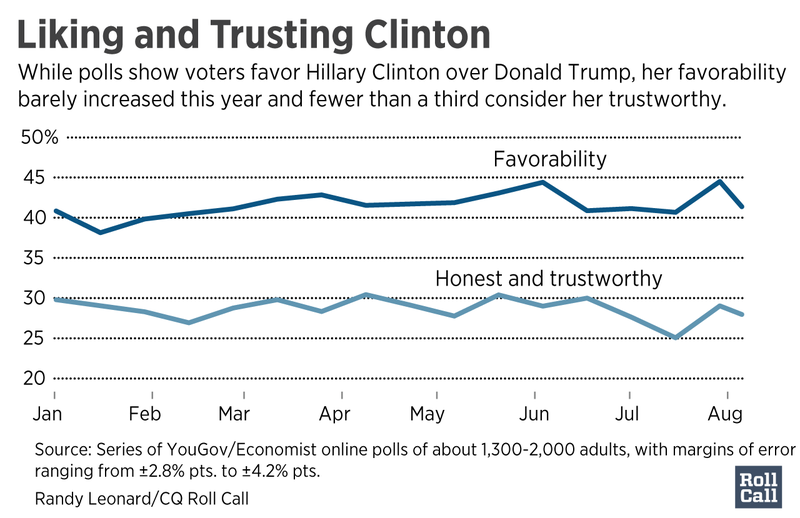 "Most voters don’t feel that way about Hillary Clinton, and it’s a dangerous matter of trust," Fournier wrote. "She can’t convince voters that she’s always been honest — not in an era that equips people to be their own electronic fact-checkers. She can’t give today’s voters the authenticity they crave." Fournier said Clinton needs to show that "she’s their liar — she’s on their side — and the other side lies almost as much." The New York Times&apos; David Brooks wrote at the beginning of the Democratic National Convention last month that the reason the American public is generally wary of Clinton is because she responds to attacks with distrust and secretiveness. "You’ve ended up projecting coldness but also weakness and hurt," Brooks wrote in an open letter to Clinton. "People who build emotional walls amid conflict do so out of fear, not strength." "The confident move is to break out of the emotional bunker with vulnerability. … Imagine if you displayed honest self-appraisal and even moments of remorse. You’d have the world rooting for you, not against you," Brooks wrote. This was the portrayal of Clinton that many Sanders supporters carried with them into the party&apos;s convention in Philadelphia last month. After Clinton became the presumptive nominee in June, a Bloomberg Politics poll showed that almost half of Sanders supporters would not vote for her in the general election. A few dozen Sanders supporters told Bloomberg that they still distrusted Clinton and their support was based on who was the more trustworthy candidate not associated with corruption in Washington. Trump has springboarded off Sanders&apos; words to keep up his attacks on her trustworthiness. He has used Clinton&apos;s low ratings on trust as the inspiration for his nickname for the Democratic nominee and why he says people should vote for him. Recently, Trump just referred to her as "crooked." I see where Mayor Stephanie Rawlings-Blake of Baltimore is pushing Crooked hard. Look at the job she has done in Baltimore. She is a joke! The dishonest media didn&apos;t mention that Bernie Sanders was very angry looking during Crooked&apos;s speech. He wishes he didn&apos;t make that deal! Clinton did not do herself any favors when she told Fox News&apos; Chris Wallace that FBI Director James B. Comey said that her answers to the agency were truthful. This claim led The Washington Post&apos;s Fact Checker blog to rate Clinton&apos;s answer as "Four Pinocchios," a labeling used for statements that are "whoppers." Clinton later tried to clarify those comments. "So I may have short-circuited it and for that I, you know, will try to clarify because I think — you know, Chris Wallace and I, we&apos;re probably talking past each other be — because, of course, he could only talk to what I had told the FBI and I appreciated that," she said at a national black and Hispanic journalists conference last week. NBC political anchor Chuck Todd broached the subject of honesty to Clinton&apos;s running mate Sen. Tim Kaine Sunday on "Meet the Press," asking the Virginia Democrat how the campaign could restore the trust between its standard-bearer and the American people. Kaine said, "I am not assuming that&apos;s going to be the case even a month from now. I think we came out of the convention with a real positive momentum." Kaine said later that Clinton was able to tell her story of public service at the convention and "that people were reintroduced to that story in a positive way."